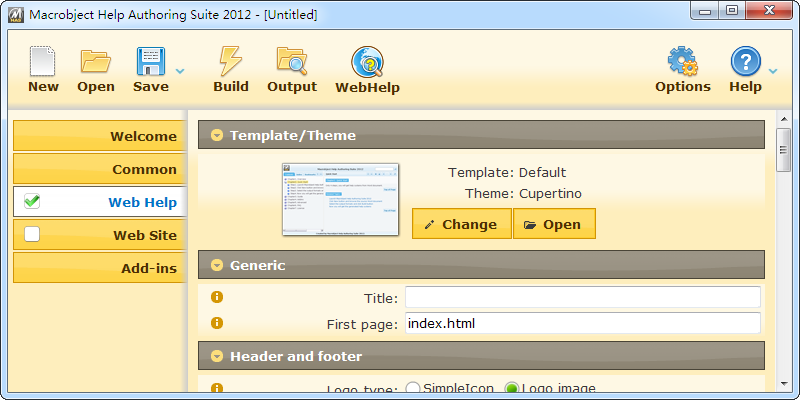 WebHelp Authoring Suite (Word-2-Web) 2012 is a fast Web help tool generating HTML based help from Word doc/docx. WebHelp Authoring Suite can convert Word to Web based help and generating Web help system from Word document quickly. No worry about how to making Web help system anymore! Generating Web help system from doc or docx as easy as Word processing now! Key Features: Full-text search; Flash/multi-media supported; Template based and full customizable; Batch command line. You could building your webhelp from doc quickly with WebHelp Authoring Suite 2012. You could also save your conversion work as a project for re-use with WebHelp Authoring Suite 2012. WebHelp Authoring Suite is a really powerful yet easy webhelp generator for technical communicators and policy writers and other content creators. That is the power of WebHelp Authoring Suite. Just focus on the content! More Features: Web help generated according to outline of Word document; Customize the automatically created Table of Contents and index; All links or anchors or bookmarks will be converted into hyperlinks; Customize your content such as header/footer or navigator or related topics; Supports Word master and sub-documents; Context-sensitive help supports; Supports Word HTML cleanup; Customizable templates for Web help system; Visual template settings. Creates multi-language versions of Web based help system easily. Forget ALL the free Reviews and product Hype you've read on how to get rid of Acne. Because if you think you're getting the truth - THINK AGAIN! I can show you a simple one step, economical and convenient method that starts working from day one. Saleem is desktop application that designed to allow users to write and use Arabic characters in Adobe products like Flash, Capitivate, Photoshop ...etc and other software that does not support Arabic language. HLP to RTF Converter allows you to convert any HLP to RTF easily. It is designed to create printable, manual-quality RTF format documents or recompilable projects from Microsoft Windows Help. Also it can be used from the Command Line Prompt. Batch PPT TO HTM Converter is a PowerPoint PPT/PPTX to HTM Batch Converter can convert PowerPoint PPT(X) to HTML easily. Batch PPT TO HTM Converter supports powerful search for lots of files. A HTM publisher for PowerPoint. Batch DOC TO HTM Converter is a Word to HTM, DOC/DOCX to HTM Batch Converter that can convert Word DOC/DOCX to HTML easily. Batch DOC TO HTM Converter supports powerful search for a lot of files. A HTM publisher for Word. Cyber-D's SQL wizard makes it easy to generate SQL queries from CSV data. This tool is ideal for people who need to insert large amounts of data into an SQL database. Batch CHM TO PDF Converter is a CHM to PDF Doocument Batch Converter that can convert HTML Help to PDF document and file easily. Batch CHM TO PDF Converter supports powerful search for a lot of files. A Compressed HTML Help converter for Windows. Create help files (HTML Help, Web Help and PDF) from Microsoft Word document. Convert Word document to HTML Help (.chm), Web Help and PDF. This site does not contain serial number, crack, keygen WebHelp Authoring Suite 2012 serial number : serial number is the simplest type of crack. A serial number(cdkey,product key,etc) is register the program as you may already know. a crack or keygen may contain harmful software. If you cannot find the exact version you want, just give it a try. for more information read .nfo/.txt/.diz file include in zipped file.